KYOGEN: Discover a wonderful hidden cultural gem at ASIJ! A giant dancing snail, a vengeful samurai master, a masked oni, and several gullible servants made their sometimes gleeful, sometimes solemn, but always comical way across the Kyogen stage on Tuesday night, March 4, in ASIJ’s Ricketson Theater. A huge congratulations to seniors Kyoko Sano and Sarah Muir, and juniors Yuri Goto, Astrid Evenson, and Rika Sato Baran for their wonderful performances as well as their off-stage work in the plays “Kagyu” and “Shimizu.” A big thank you as well to faculty member Reiko Aya for acting as a last-minute stand-in for a sixth member. Human foibles are comically highlighted in Kyogen plays, a Japanese performing art that spans the centuries. While every aspect of Kyogen, with its 650 years of history, epitomizes traditional Japanese culture, Kyogen storylines are accessible to all of us regardless of our cultural background or the era we live in, because the themes of Kyogen plays are eternal: they poke fun at human gullibility, jealously, laziness, resentment, at our bad habits. At ASIJ, we are tremendously fortunate each year to have two professional performing artists—Yasutaro Yamamoto and Noritaka Yamamoto of the Okura School of Kyogen—work with our students in preparation for our annual March performance night. They are well-known and highly-respected artists who regularly perform at the National Noh Theater in Tokyo and on Noh stages across the country, as well as internationally. Passed down through the generations of their family of artists, Kyogen is their life’s work. As is the custom in the world of Kyogen, they themselves have been performing professionally since early childhood, and the head of their family, Tojiro Yamamoto, is designated by the Japanese government as a National Living Treasure. What a treat it was to have these two artists, along with Rintaro Yamamoto, perform the well-known play “Boushibari” in the Ricketson for us this year. If you missed the show, you can watch it now on ASIJ TV. 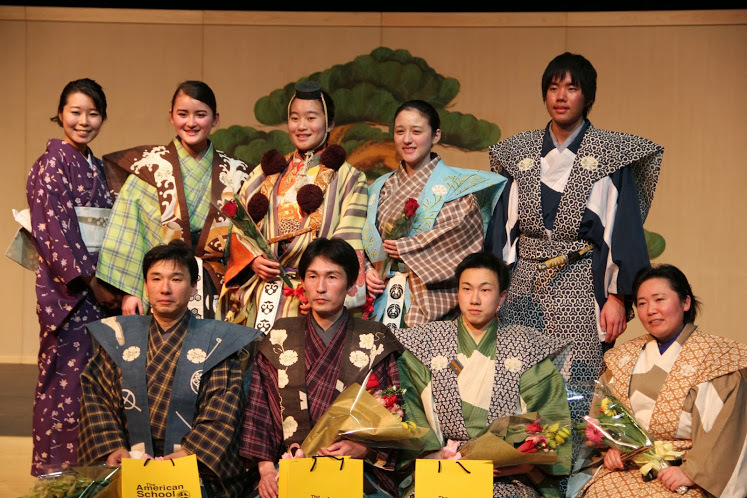 Are you an ASIJ student who wants to act in a Kyogen play?